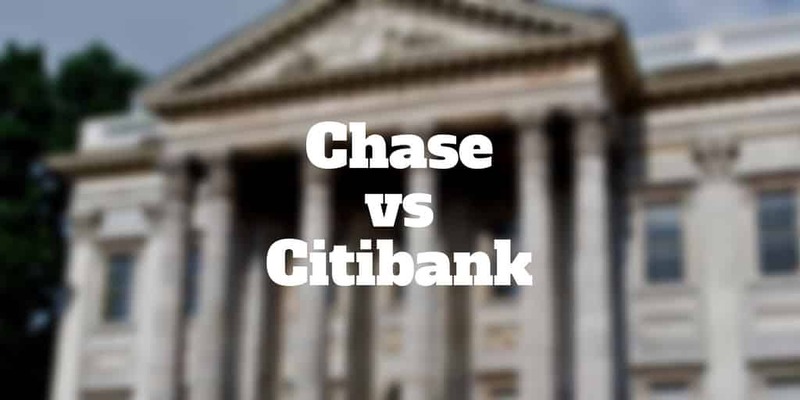 Home › Banking › Chase vs Citibank Review: Which Bank Is Better? Chase vs Citibank Review: Which Bank Is Better? When you compare Chase to other big-name banks like Bank of America and Wells Fargo, you quickly discover that Chase wins out when it comes to fees, minimum deposit requirements, and sign-up incentives. But other banks often beat Chase to the punch on interest rates on savings and certificates of deposit. The question is when we compare Chase Vs Citibank, does the same pattern emerge? Whether you are looking for a checking account, savings account, or certificates of deposit, we will highlight the winner between the two big banks in each category. Which Is The Best Bank To Use? If you are a frequent traveler, Citibank is probably a well-known name to you. Across the world, Citibank has an almost endless number of branches. In fact, we counted 2,649 branches in 19 countries, including 723 branches in the United States. Frequent travelers who like the idea of walking into a trusted financial institution when abroad should probably choose Citibank, which is hard to beat for its global presence. While Citibank has thousands of branches overseas, United States residents may be better served at Chase, which has over 5,000 locations. Convenience aside, the big question is how do Citibank and Chase stack up on fees, costs, interest rates, and minimum deposit requirements. If you don’t need much more than a checking or savings account and tend to keep low balances, Citibank may be the best choice because it imposes no minimum deposit restrictions on either account. It also pays a slightly higher interest rate on savings account deposits. And savings account holders are not penalized with monthly charges as they are at Chase. Savings rates on certificates of deposit are also more favorable at Citibank. This patterns is familiar when comparing Chase to other brand-name banks. Chase tends to come in second place on interest rates paid on savings. Whether you are choosing a 2-year, 3-year, or 5-year certificate of deposit, Citibank pays higher interest rates. Citibank also has a substantially larger network of fee-free ATMs compared to Chase. In fact, it has almost 4x more ATMs in its network. Lastly, Citibank won’t sting you with fees on extended overdrafts but Chase will hit you with a double-digit charge. If you want to pocket a bonus when signing up for a new account, Chase is the better choice. It frequently runs promotions that pay as much as $150 for opening new checking and savings accounts. And you don’t need to deposit as much to get started with a savings account, just $25 versus $100 at Citibank. Within the United States, Chase has a much larger branch network. While overseas travelers will do better with Citibank, domestic users may find Chase more convenient. On some factors, Chase and Citibank stand toe-to-toe. Monthly checking account fees, out-of-network ATM fee charges, and overdraft charges are all identical. Plus, both banks provide intuitive mobile apps for both iOS and Android device that make it easy to bank on-the-go. Although both Chase and Citibank impose checking account fees, it is possible to waive them. Seniors over the age of 62 also qualify for free checking. Similarly, you can waive Savings Account fees at both Chase and Citibank. As long as you have a daily balance above $300, you can waive savings account fees. Other ways to enjoy a free Chase savings account is to link to a premium Chase checking account, transfer at least $25 monthly, or be under the age of 18. Similarly, Citibank waives savings account fees when a daily balance of $500 is held. Fees are also waived for individuals under the age of 18 and for account holders who make monthly automatic transfers. Chase and Citibank both feature extensive ATM networks, nationwide branches and 24/7 customer care. It’s impossible to separate them when it comes to checking account fees, out-of-network ATM fees, overdraft fees, and early withdrawal penalties. Where they differ is on the interest you can earn on savings accounts and certificates of deposit – Citibank offers substantially higher interest rates. Citibank also has lower minimum deposit levels on checking accounts and a much greater network of no-fee ATMs nationwide. Where Chase shines compared to Citibank is in three areas: lower minimum deposit threshold on savings accounts, no overdraft protection fee, and many more branches within the United States. And it doesn’t hurt that Chase provides attractive sign-up bonuses too! Have you compared Chase vs Citibank? Tell us what you think, we would love to hear from you. >> Chase Vs Wells Fargo: Which Is Better? ‹ Martin Armstrong vs John McAfee: Who Is Right?